You may remember Daniel Shapiro here; he's the Portland Trail Blazers fan who had his picture taken with a remarkably unimpressed Greg Oden on an airliner recently. 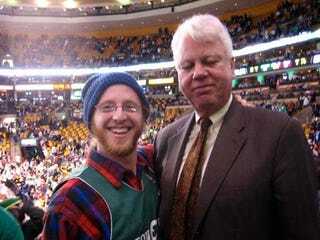 Here he is again at some unnamed sporting event with Boston Globe scribbler Bob Ryan, where it seems as if the only way Ryan could be less thrilled was if he were posing with Joumana Kidd. If people hate having their picture taken with Shapiro so much, why do they do it? Actually, Dan's starting to get on my nerves as well, and I have no reason why.